What’s changed in the past ten years? Well, though great strides have been made towards environmental awareness and responsibility in the Jewish community, we have not yet been successful at rousing the kind of organized, broad-based, full-throated response that Jewish values demand. There are so many reasons not to confront climate change head on, but time for patient and polite explanation is running out. Last month the Intergovernmental Panel on Climate Change, the leading international body composed of scientists from more than 80 countries released its most damning report on the social, environmental, economic, health and political impacts of human-caused climate change to date. Then, last week, a National Climate Assessment, commissioned by the U.S. Government shared the ominous forecast that the US economy would contract by as much as 10% by the end of the century as a result of climate change. And as if to provide tragic real-time evidence, these reports hit the press as devastating fires, due in part to another too hot, too long summer, raged in California. Among the casualties of the fire were Jewish camps, organizations, businesses and homes. Humanity has changed its environment. Anthropogenic climate change is upon us regardless of how uncomfortable and frightening that concept makes us feel or how much we may not want to believe it. And for many around the world it’s no longer merely a concept or belief. It’s the fire raging on the next hill, the hundred year floods that take place annually and make it impossible to afford insurance, the superstorms that destroy homes, schools and houses of worship, the droughts and famines that cause war and produce climate refugees. As if to add insult to injury, those most profoundly affected are those who have contributed least to the problem, the lowest emitters of greenhouse gases. This reality is frightening to confront in part because we feel ill equipped to address it and in part, because we have been told repeatedly that we don’t need to. The federation executive who reacted to my presentation came by his misinformation honestly. Those who stand to gain financially and politically from our feeling disempowered have muddied the facts, or flat out lied, even as the possibility of mitigating the problem has been well within our grasp for decades. A recent article by Bill McKibben, in The New Yorker recounts the reprehensible efforts by big oil to spread lies and kill policies that would curb carbon emissions. How can we confront a challenge that we are told through well-funded misinformation campaigns is not real? We are a people who have time and time again confronted seismic change and existential challenges courageously. This challenge demands truth, time and tzedakah. First, don’t buy the lies and manipulations of the truth, familiarize yourself with the facts. The McKibben article cited above is a good place to begin or this overview in the Skimm. Second, take time to lobby your representatives to support local and federal legislation to adopt renewable energy, limit use of fossil fuels and stay committed to the ground-breaking Paris Climate Agreement. Third, give tzedakah. There are many movement-building efforts underway that would benefit from increased philanthropy and participation including the Religious Action Center, Jewish Climate Action Network and Hazon among others. The urgency of the moment demands much greater involvement by us all individually and by the Jewish community as a whole. To paraphrase Ruth Messinger, we cannot enjoy the convenience of ignoring the laws of nature nor the luxury of being overwhelmed. Rachel Jacoby Rosenfield serves as Executive Vice President at the Shalom Hartman Institute of North America. 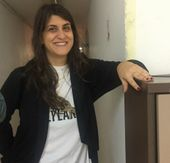 She was the founding director of the Jewish Greening Fellowship and has served on numerous committees and advisory boards related to sustainability and climate change. This story "Our Country Is Burning, It’s Time To Act" was written by Rachel Jacoby Rosenfield.